The front page is only so big, old news items will be archived to here so you can catch up on what you've missed once they've rolled off the front page. This update is a new session. It is summer 1958. Today you are driving the Hellifield - Hawes and return stopping passenger train. Passenger services from Hawes to Northallerton ceased in April 1954 but the line is still used for other services. A late-running Northallerton parcels train at Hawes will add to your work today. Instead of being able to proceed directly to Platform 1 and simply run around your train ready to return south, you will need to disembark your passengers at Platform 2 and then shunt your carriages to Platform 1. All services to Hawes will cease in March 1959. Your train is normally worked by a Class 4MT 2-6-4 Tank Engine, but none was available due to maintenance requirements. Today, you will be driving a Stanier Class 5MT (Black 5) as the replacement engine. The session commences as you approach Horton-in-Ribblesdale. You will stop all stations to Garsdale, turn your engine and proceed to Hawes. You will then return, again stopping at all stations. Total session time: 1 hour 50 minutes. More detailed information is provided in the in-game instruction panels. The sessions comes from the S&C Sessions Group initiative.The session author is Frank Bott (briefencounter). You can find a link to the download, on the 'Sessions' page, which is accessible from the 'Content' page. (Or use the link from the 'latest content' column on the right). 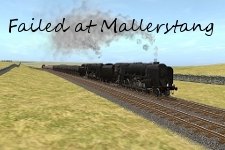 In this session you are driving another 9F from Carlisle Kingmoor MPD, sent to rescue the stranded train in the "Failed at Mallerstang" session and clear the line. Download the .zip file and un-pack to a known location. A file is included with instructions. A 9F heading a rake of anhydrite hoppers has come to a halt at Mallerstang. The stricken train was failed an hour earlier because of a problem with the vacuum-brake ejector. The train is blocking the line and another locomotive must be sent to rescue the stranded train and clear the line. Ride with Gus in the rescue loco or jump on board with any of the other trains in the area to see the results of having to work around the blockage in the line. All the locos in the session have drivers and orders assigned so you can just go along for the ride, or you can kick the drivers out and take over their roles yourself. If you don’t feel confident with that, there will be some further sessions released in the near future with specific roles for you to undertake. Settle & Carlisle Add On, also with the Service Pack installed. There will also be a requirement to make a modification to one asset. Instructions for performing this edit are included and the necessary files are included in this package. The sessions comes from the S&C Sessions Group initiative. The session author is Frank Bott (briefencounter). A little later than I hoped, here is our new offering. 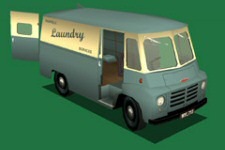 This update is a new lorry, namely the Bedford TK. The TK range replaced the S type in 1959 and was later to be available in a variety of derivatives. Available with inline four or inline six cylinder petrol and diesel engines the TK was a common sight in the UK throughout most of the 1960s and 1970s, competing with the similar Ford D series. The three models here are liveried for parcel services operated by British Rail and were created by Andy Kemplen. You can find a link to the download, on the 'Scenery' page, which is accessible from the 'Content' page. (Or use the link from the 'latest content' column on the right). Sorry for the long wait, hopefully we'll get back into our stride now. 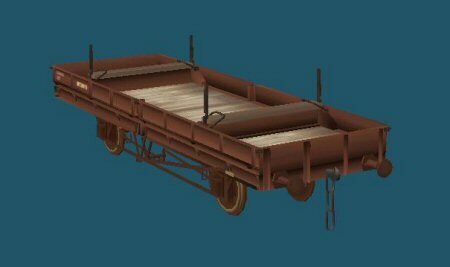 This update is a new wagon, namely the double bolster wagon. 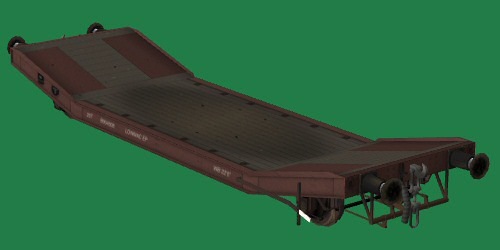 This comes complete with three levels of weathering, which are randomly selected when you place the wagon, and four new loads which are included in the pack. 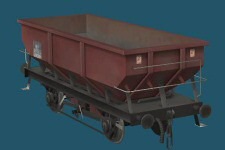 You can find a link to the page for the wagons in the 'Flats' section of the 'Additional Wagons' page, which is accessible from the 'Content' page. (Or, as before, use the link from the 'latest content' column on the right). 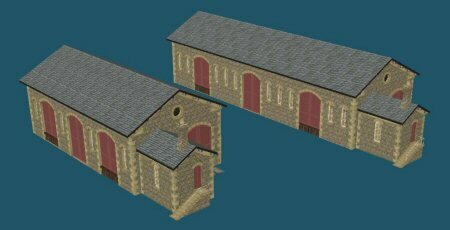 This update is some replacements for the S&C goods sheds. These provide texture replacement to enable a single shed to be used in various guises. There are also improved scripts to overcome some of the issues in the current releases. You can find more details , and a link to the download, on the 'Scenery' page, which is accessible from the 'Content' page. (Or use the link from the 'latest content' column on the right). This update is a new session to be played on the SnC Vale of Eden route. This was created by user "incredulousmonk" and takes the form of a shunting challenge. You can find more details , and a link to the download, on the 'Sessions' page, which is accessible from the 'Content' page. (Or use the link from the 'latest content' column on the right). To follow on from last week's update we have the GUV in Blue with 'Newspapers' branding. This is configured to use the newpaper trolley product and the newspaper depots. You can find a link to the page for the GUVs at the bottom of the 'Additional Wagons' page, which is accessible from the 'Content' page. (Or, as before, use the link from the 'latest content' column on the right). This week's update is another version of the CCT. 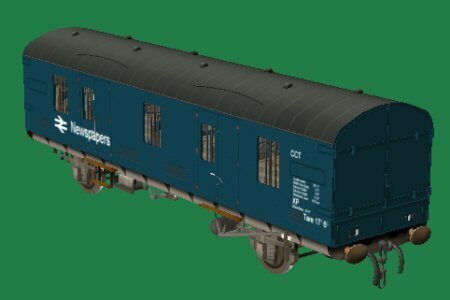 This time the BR Blue livery with 'Newspapers' branding. You can find a link to the page for the CCTs at the bottom of the 'Additional Wagons' page, which is accessible from the 'Content' page. (Or use the link from the 'latest content' column on the right). To accompany this is a new industry to handle newspaper trolleys. This Newspaper Depot facility has full industry interactivity and is configured to handle the newspaper trolley product used by the CCT and GUV wagons. You can find it at the bottom of the 'Scenery' page. This week's update is another livery version of the CCT. 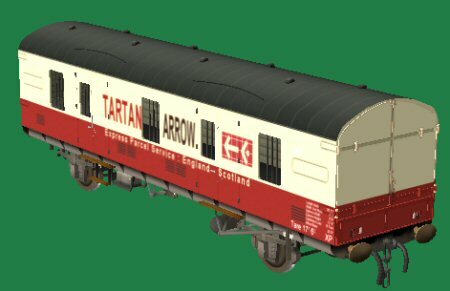 This time the Tartan Arrow branding. More updates and additions next week. 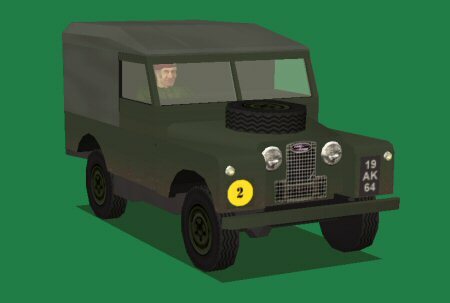 This week's update is a scenery version of the Army Land Rover. You can find the Land Rover at the bottom of the 'Scenery' page. (Or use the link from the 'latest content' column on the right). This time the BR blue livery with the Red Star parcels branding. 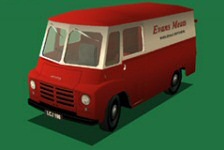 This week's update is another livery version of the GUV. This time the BR lined Maroon. This week's update is all about parcels. First up is a modification to the Mail Depot industry released a while ago. This update enables the industry to fully use the queues. An addition is a shorter version of the industry for use in more confined spaces. Next up is another livery for the CCT wagon. This new livery is the BR lined Maroon. You can find a link to the page for the CCTs at the bottom of the 'Additional Wagons' page, which is accessible from the 'Content' page. (Or, as before, use the link from the 'latest content' column on the right). 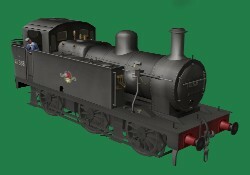 To start this week is a further update to the Fowler 4F locomotive. This update improves the smoke effects and also adds an improved shadow for the tender and improved texture for the boiler backhead. You can find this on the 'Updates' page. The next is a set of additional signals. 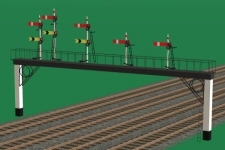 There are 7 Midland Lower Quadrant signals, some more LMS Upper Quadrant signals to extend the existing range, and a custom signal as seen at Holyhead. The LMS versions include some for platforms and ones for use where there is restricted clearance. The signals were created by Anthony Simmons (francelinetony) and can be downloaded from the bottom of the 'Additional Signals' page, which is accessible from the 'Content' page. (Or, as before, use the link from the 'latest content' column on the right). 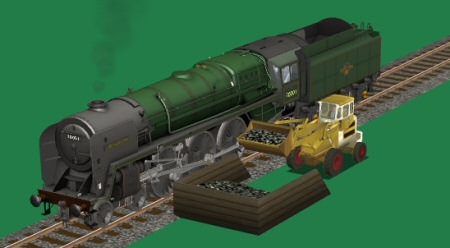 The first item this week is an update for the Fowler 4F locomotive. This update resolves a problem with saving the headcode state and adds better tracking of the wheels on tight curves. You can find this on the 'Updates' page. The next is another of the TPO Mk1 coaches. This is the Stowage Brake Van which is built to diagram 733 and has the addition of a guard's compartment. You can find a link to the TPO stock at the bottom of the 'Additional Wagons' page, which is accessible from the 'Content' page. (Or, as before, use the link from the 'latest content' column on the right). 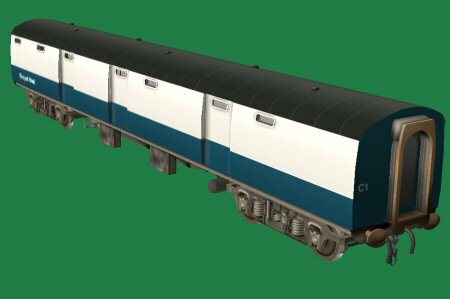 The update this week is a set of additional liveries for the Mk1 coaches. This is the Regional Railways livery and comes applied to 6 variants with two livery variations for the BSK and BSO. 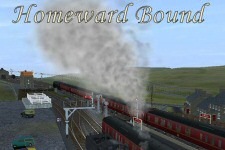 The update this week is a fix for the steam effects for the A3 locomotive. The update can be found on the Updates page, or click the image in the right hand column to go directly to the page. 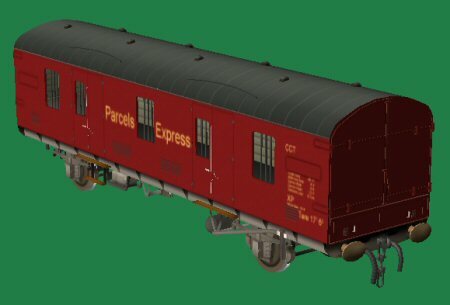 The update this week is a further livery for the CCT wagon.. This is the later BR blue livery with a red stripe. The stripe was added to the CCTs which remained in service between 1986 and 1988. You can find a link to the page for the CCTs at the bottom of the 'Additional Wagons' page, which is accessible from the 'Content' page. (Or, as usual, use the link from the 'latest content' column on the right). The first item this week is a further update for the Jinty to correct the smoke effects, which became broken following the last update. The updates page now contains a link to this version (42). 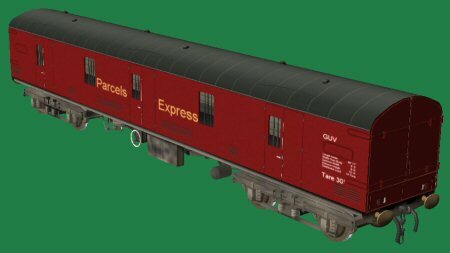 The new content for this week is the GUV in the Parcels Express branded maroon livery. You can find a link to the page for the GUVs at the bottom of the 'Additional Wagons' page, which is accessible from the 'Content' page. (Or, as usual, use the link from the 'latest content' column on the right). This week's update is a modification to three of the steam locos. The modifications have been made to the arrangement of the bogie attachment points in order to make the locos track better around tight curves. The three locos are the 3F Jinty, the 8F, and the A3. These items can be found on the Updates page, or click the image in the right hand column to go directly to the page. This week's update is a collection of scenery items which can be used to construct a coal yard or similar feature on a route. 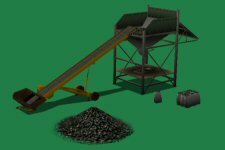 The pack contains a coal yard hopper and elevator, some sacks and a pile of coal. There is also a Weatherill 42HD loader which is used to add the coal to the hopper if the elevator is not required. 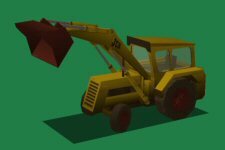 If the elevator is used than there is a JCB 3L included, along with an animated version of the JCB 3C, which can be used to bring life to the scene. These items were all created by Andy Kemplen (kemplen) and can be found on the additional scenery page, or click the image in the right hand column to go directly to the download page. 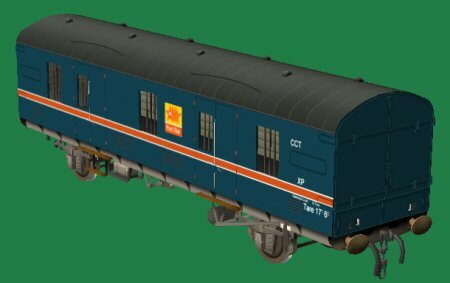 This week's update is another livery for the CCT wagon. The new livery is the BR Maroon with Parcels branding. This week's update is a pack of 5 Mk1 coaches. The pack contains three coaches (BCK, FO, RB) in the Inter-City Charter livery. These also include a new bogie and a replacement bogie sound to go with it. Also included are a FK in the Motorail livery and a RB with the alternate 'INTERCITY' branding. This week's update is the first of the set of TPO (Travelling Post Office) stock. 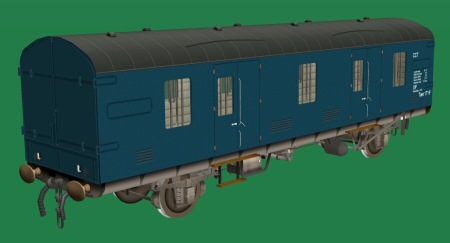 This initial release is the stowage van and is in the BR blue livery. 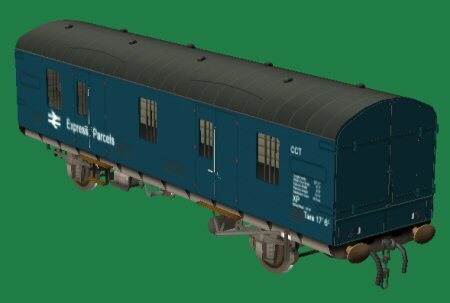 This week's update is a version of the GUV in BR blue livery with the Express Parcels branding. This week's update is a pack of 8 Mk1 coaches in the Inter-City livery with the Inter-City branding logo applied. A further set of Mk1 coaches in the Inter-City 'Charter' livery will follow soon. The new livery is the BR Blue with Express Parcels branding. There is a two part update this week. 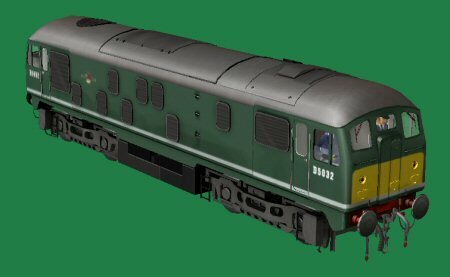 The first item is an update for the Class 24 in the green livery with the yellow warning panels. This has been corrected to have yellow headcode disks on the bottom. The second item for this week may not come as a surprise to those of you who have noticed a bit of a pattern developing with these... it is a GUV in the BR green livery. 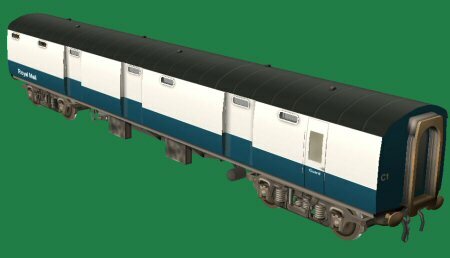 This week's update is a pack of 13 Mk1 coaches in the Inter-City livery. A further set of Mk1 coaches in this livery with the Inter-City logo, and the Inter-City 'Charter' coaches will follow soon. A correction to the last update as the cdp files for the example sessions were created without the HTML file necessary to run the sessions. If you have not already downloaded the example session packs they have now been updated to include the previously missing item. This week is a two part update. First up this week is a link to the service pack update for TS2010 users of the S&C pack along with some documentation and some example sessions to help you make the most of the updates included in the pack. There are full details of the pack and the extra items we have available to support it on the 'Updates' page. 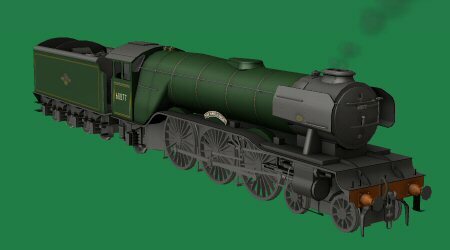 The additional content this week is the CCT in the green livery. 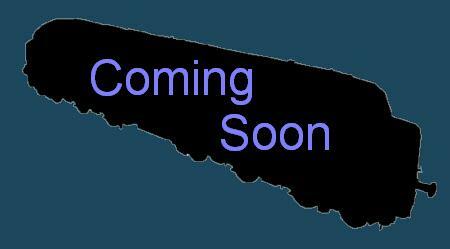 This week's update is another livery of the GUV wagon and an update to the blue one released previously. The addition is the one in the plain maroon livery. The scripting updates include a modified load to cure the doors opening and closing too fast and it now attaches a tail lamp when on the end of the train. The blue version also has these updates now so re-download that also please if you have the previous version already. Also this week is a re-upload of the Blue CCT as the incorrect file was put up last week that did not include the script changes. 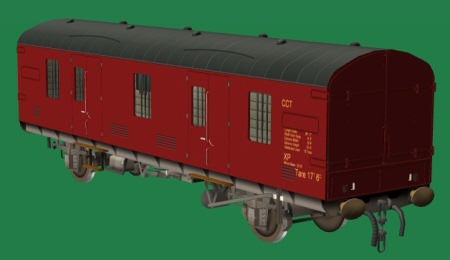 You can get the CCT update from the 'Additional Wagons' page as well. So that is three wagons for today, the GUV in Maroon is new, and the Blue GUV and the Blue CCT are updates. If you find any issues with any of the content on the website then do please let us know through the forums. Whilst we test things before we release them errors do sometimes slip through and if we haven't noticed them then we won't be able to look at fixing them. We can't promise to resolve any issues immediately but if nobody tells us they have noticed a problem then it will never get fixed. 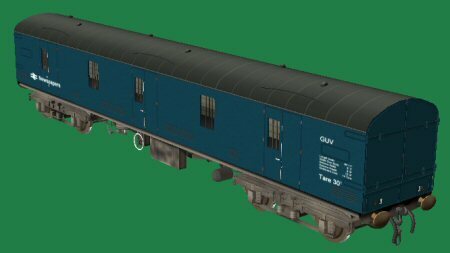 This week's update is another livery of the CCT wagon and an update to the blue one released previously. The scripting updates include a modified load to cure the doors opening and closing too fast and it now attaches a tail lamp when on the end of the train. This week is a signal week. 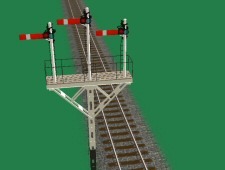 The release is a pack of additional upper quadrant LMS signals. This pack contains six junction home bracket signals on various post types along with a pair of 40ft home co-acting signals. 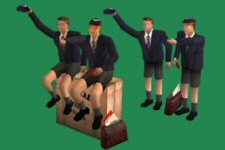 The signals were created by Anthony Simmons (francelinetony). 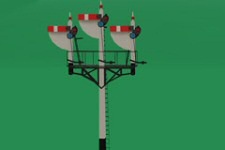 These signals can be found on the additional content page under signals, or click the image in the right hand column to go directly to the download page. This week's update is a further wagon. The GUV (General Utility Vehicle) was used to carry parcels, newspapers, and general goods. The model features animated couplings and doors and is designed to match with the Mk1 coaches. It is also configured to use the same mail trolley product as used by the CCT and Mail Depot released previously. 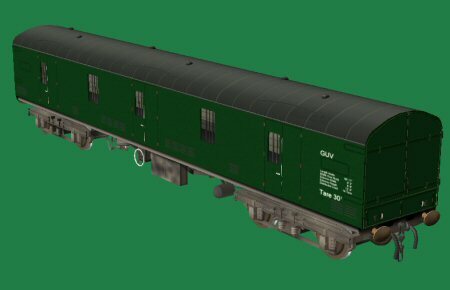 This week's update is a pack of 15 Mk1 coaches in the later green livery with coloured bands to denote usage. This week's update is a few scenery items. The first item is a 1963 Hymac excavator. This is bundled with a couple of caravans, one ready to hitch up and tow away, the other static with the doors open. 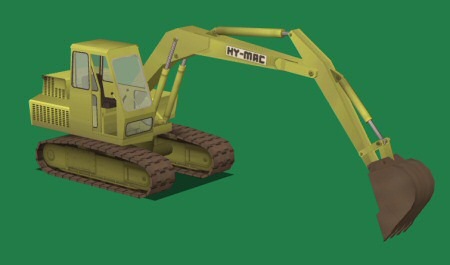 The excavator and caravans can be found on the additional scenery page, or click the image in the right hand column to go directly to the download page. This week's update is a pack of 13 Mk1 coaches in the Network SouthEast livery. This week's update consists of a number of related parts. The first item is a new wagon. The CCT (Covered Carriage Truck) was used to carry parcels, newspapers, and general goods. 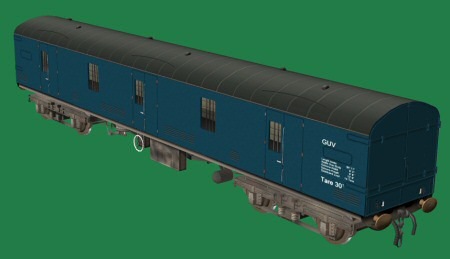 The model features animated couplings and doors and is designed to match with the Mk1 coaches. 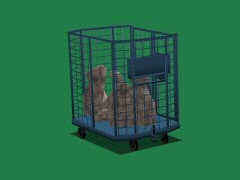 The second item is a new Mail Trolley product which has been produced from the BRUTE trolly created by Andy Kemplen. The CCT has been configured to load this product and the trolley is included in the download pack for the CCT. The last item this week is a new industry asset. This Mail Depot facility has full industry interactivity and is configured to handle the mail trolley product used by the CCT wagons. Trolleys left at the depot will appear at the front edge of the platform area and will be 'sorted' over time to the rear of the platform area ready for collection. 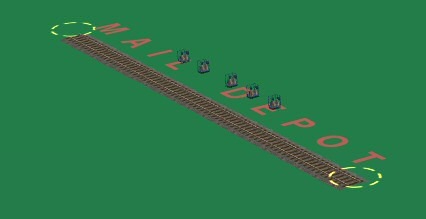 The 'Mail Depot' wording is visible in Surveyor only and is designed to indicate the area in which the trolleys will be placed. The intention is that the depot will be 'dressed' with a platform of your choice, under this indicated area, and any suitable buildings added as scenery which can be used to create the depot itself. The download for the depot includes the Mail Trolley product. The Mail Depot can be found on the additional scenery page, or click the image in the right hand column to go directly to the download page. 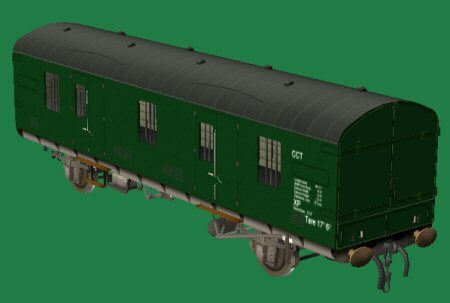 This week's update is a pack of 21 Mk1 coaches in the green livery. This week's update is a pack of 19 Mk1 coaches in the Brown and Cream livery. 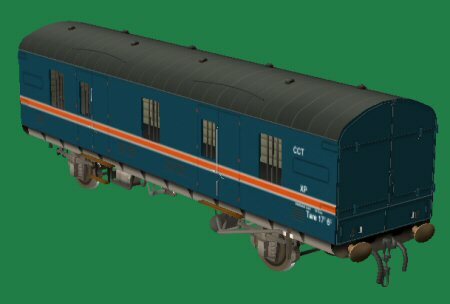 The update for this week is a set of the Suburban coaches in the blue livery. The coaches can be found on the additional content page, or click the image in the right hand column to go directly to the download page. This week's update is a selection of additional signals. First up is a set of Lower Quadrant BR signals. 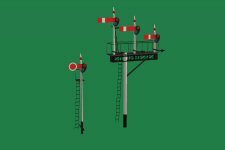 This set contains a total of 74 signals, including junction, gantry and bracket types, along with some route indicators and a gantry to place the signals on. 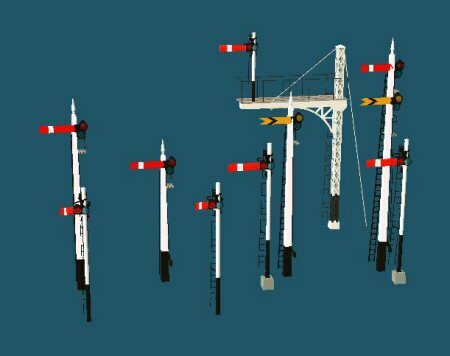 The next set is a range of LMS Upper Quadrant signals. Full details of all the signals included in each pack, and their creators, can be found listed on the download page. The site content listing and the spreadsheet have also been updated to include these signals. Here’s a novel way to load replenish your steam locomotive’s tender with coal: use a front end loader. While not common, this method was observed in use at some minor depots in Britain during the 1950s and 1960s.The facility modelled here has full industry interactivity accompanied by loader animation and smoke and sound effects. 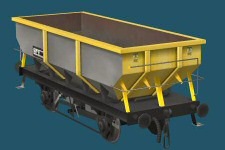 A trackside coal staithe with an animated load of 21 tons capacity can be replenished by delivery from an open rail wagon. A tender brought to a stand at trackside post markers will trigger the Weatherill loader into action. The number of 1.5-ton Weatherill bucket loads that can be delivered to the tender is calculated by script. Each animation cycle consists of the Weatherill loading its bucket at the staithe then manoeuvring the bucket load over the tender before dumping it. This should also prove useful when running steam specials on a modern era route without full coaling facilities. 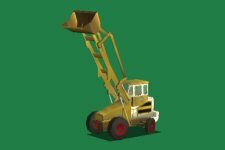 This tender loader industry was created by Andy Kemplen and Leigh Stokes. The loader can be found on the additional scenery page, or click the image in the right hand column to go directly to the download page. 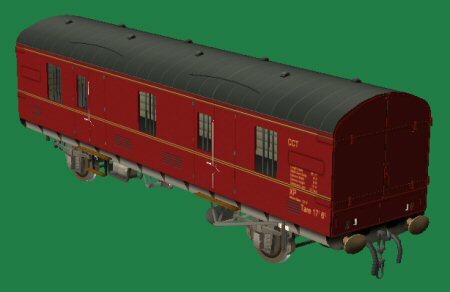 The update for this week is a set of the Suburban coaches in the lined maroon livery. Fully compatible with TS2009 and includes a custom cab. There are a couple of updates this week. The first of these is a modification to the engine spec. for the Class 45 Peak locomotive to increase the tractive effort available and prevent the excessive wheelslip currently being seen. The loco download has been updated to include the new spec for new downloaders of the loco, but if you only need the updated engine file you can download just that from the 'Locos' page, or click here. 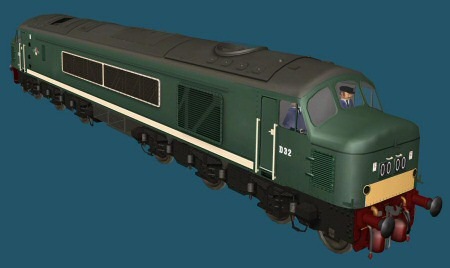 The next update is for all four of the Class 24 locomotives included in S&C. 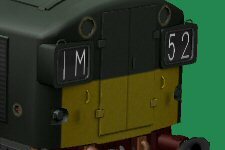 Numbering has been fixed, a texture has been replaced on the roof grill, and the amount of exhaust smoke has been reduced. This week's update is a pack of all the Mk1 coaches in the Carmine and Cream livery. First item for this week is a listing all of the content available on this website. This should help people track down any missing items they have. You can find the link to the page at the bottom of the 'Content' page. It is also available to be downloaded as an Excel spreadsheet. Moving onto the content offering for this week, which is a new wagon to expand the rolling stock fleet for S&C. Created by Andy Kemplen, this wagon incudes four new loads and is also configured to take the BD and FM containers. There are three levels of weathering selectable or applied randomly, and the loads have three LOD levels to reduce system impact. The wagon pack can be found on the additional content page, or click the image in the right hand column to go directly to the download page. 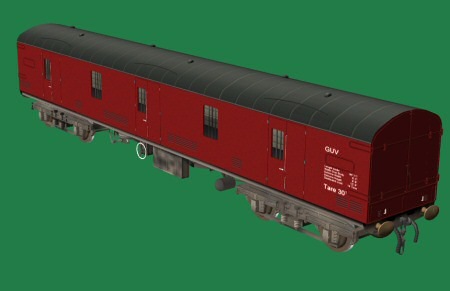 The first item this week is a further update to the Maroon and Carmine liveried versions of the Mk1 Suburban coaches. Due to an error in one of the dependency specifications which crept in with the last update they are displaying the incorrect brake hoses. This update resolves that problem. You can download the update files as .CDPs from the 'Updates' section of the site. Or click the image in the right hand column to go straight to the page. The second offering this week is a set of the Suburban coaches in the Southern green livery. To start with this week we'd like to make available the documentation for the Cattle Docks. Releasing these for TC3 users last week made us realise that the guide had not been included with TS2009:S&C as it should have been. This comprehensive guide covers the options in the scripting and includes suggested ways of getting the best from this asset. A download link has been added to the updates page, or it can can be downloaded here as a .pdf file. 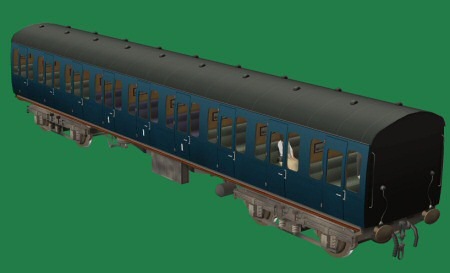 The second offering this week is the final variant of the Mk1 passenger carrying coaches we have planned to release. This version is the RF (Restaurant First) and represents the ones built to diagram 17. Capacity is 24 First Class passengers. They are available in the usual liveries with interior views. 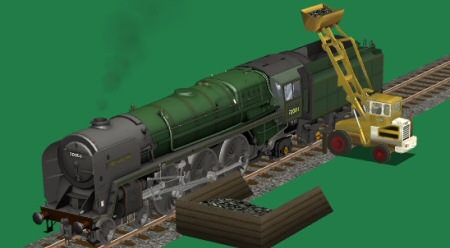 For our Christmas day update we are pleased to make available a new locomotive to add to the TS2009 fleet. This Class 45 'Peak' locomotive has most of the usual features to be found on our locos, with changeable headcodes, animated couplers, and crew. The locomotive was built by Tony Weber (trw1089) with some additional work by Paul Hobbs. Currently the cab is aliased to the built-in Class 37 cab as we thought you would rather have the loco as it is now than wait for us to build a cab for it as well. The loco can be found on the additional content page, or click the image in the right hand column to go directly to the download page. You will also need to download the engine sounds for this loco from the DLS as we do not have permission to distribute that through this site. A link for a direct download from the DLS is included on the page with the loco download. Finally, Merry Christmas from all the rail-sim.co.uk team and thank you to those who have helped contribute to the continuation of TS2009:S&C. We'll bring you more updates and additions next week. Our update this week is a new Mk1 coach to add to the collection of rolling stock. 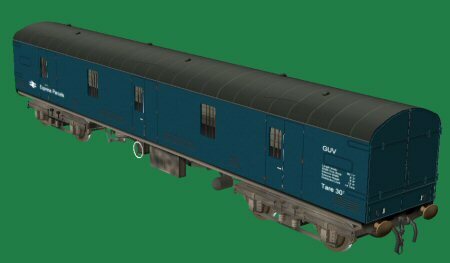 This latest variant leaves us just one more of the Mk1 restaurant coaches we are going to model and after they have all been released we will move on to do some livery packs for the existing and new coaches. These coaches represent the RBK (Restaurant Buffet Kitchen) built to diagram 26. Capacity is 12 passengers. There are two parts to this week's update. The first of these is a fix for the looping door sounds in the Mk1 coaches which occurs under certain circumstances. 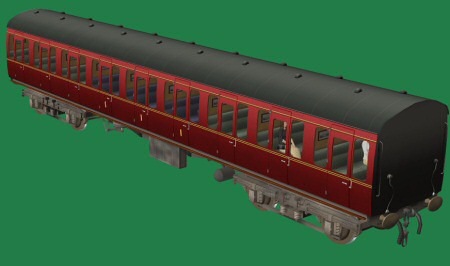 There are three files available, one for the blue liveried MK1s, one for the maroon liveried MK1s, and one for the suburban coaches in both maroon and carmine liveries. You can download the update files as .CDPs from the 'Updates' section of the site. Or click the image in the right hand column to go straight to the page. Be aware that these are quite large files as they contain new versions of every coach included in the S&C pack. The second part of this week's update is a collection of some more of Andy's vehicles. The pack contains a bulldozer, a bucket loader, and a pair of tracked farming vehicles with a plough. This week's main update is an set of additional sessions. 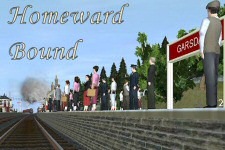 These 'Homeward bound' sessions were created by Peter Marples (peterat8), ably assisted by Leigh Stokes (Elstoko) and Andrew Howard (AndrewH). The scenario is that it has been the Hawes Show and you need to go to Garsdale to collect the visitors and return them to Leeds. The route will be busy as due to problems on both the ECML and WCML a lot of traffic has been routed over the S&C. You can choose either a Class 40 or a Black 5 for your motive power and we've also included a 'Ride' version of each session so you can watch what needs to be done before having a go yourself. You can download the sessions from the 'Addtional sessions' page under the 'Downloads - Content' section or click the image in the right hand column to go directly to the download page. The sessions make use of the HTV hopper wagons created by Pikkabird and he has given us permission to distribute them here. We've given them a light going over to make them error-free in TS2009. You can download the wagons from the 'Addtional wagons' page under the 'Downloads - Content' section or click the image in the right hand column to go directly to the download page. 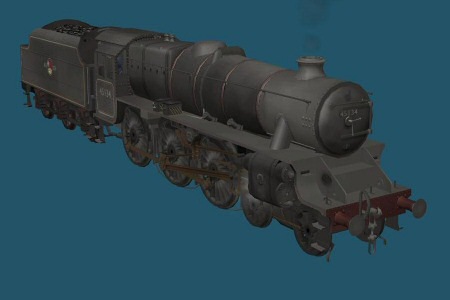 The Stanier 5MT 'Black 5' is available in both lined and un-lined versions, with three weathering levels for each. The new loco can be found on the 'Addtional locomotives' page under the 'Downloads - Content' section or click the image in the right hand column to go directly to the download page. The items this week are some Austin LD1 vans and two sets of schoolboy train spotters. The vans and spotters can be found on the 'Scenery' page under the 'Downloads - Content' section. 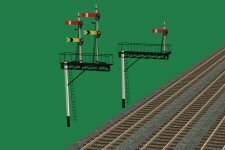 The first item this week is an update for the built-in triple disc shunting signals. The textures for these have been corrupted during the build process and as a result the signals are not displaying correctly.This update fixes that problem. The files for this update can be found on the 'Updates' page accessible from the links to the left, or by clicking the picture in the 'Latest Content' column on the right. The second offering this week is a new Mk1 coach to add to the collection of rolling stock. 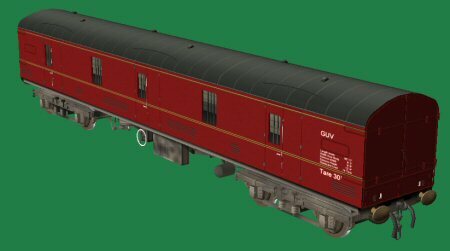 This latest variant brings us almost to the end of the types of Mk1 passenger coaches we are going to model and after they have all been released we will move on to do some livery packs for the existing and new coaches. Two updates for problem assets this week. The first of these is the tender for the Britannia locomotive. This has strange textures when viewed in Railyard and the warning flashes on the end of the tender are corrupt when in Surveyor or Driver. This update resolves both problems. 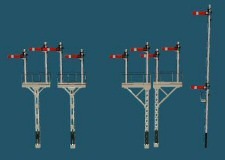 The second update is for the Semaphore Signal Gantry. This does not show when attempting to place it in Surveyor. This update corrects the issues which were causing this. The files for both updates can be found on the 'Updates' page accessible from the links to the left, or by clicking the picture in the 'Latest Content' column on the right. 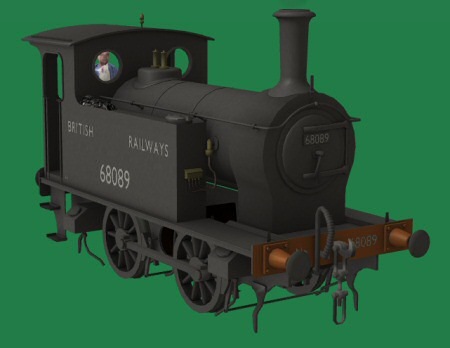 Hot on the heels of the fix last week for the incorrect coal texture, we have another update for the Aspinall saddle tank locomotive. This one is to resolve the problems experienced with the smoke drifting in all directions. The file can be found on the 'Updates' page accessible from the links to the left, or by clicking the picture in the 'Latest Content' column on the right. 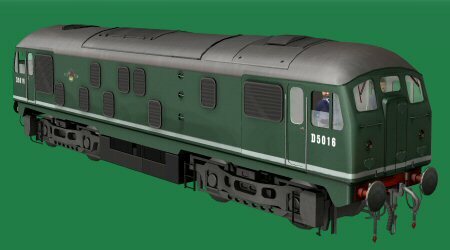 This version of the Class 40 with the split headcodes in the green livery with yellow end warning panels was somehow missed from the pack and so is being made available here. The file can be found on the 'Additional locomotives' page within the 'Additional content' section. It is accessible from the links to the left, or by clicking the picture in the 'Latest Content' column on the right.